Stages 1 and 2 include a lot of the same elements with practicing different stitches and and exploring lines and marks through stitch. 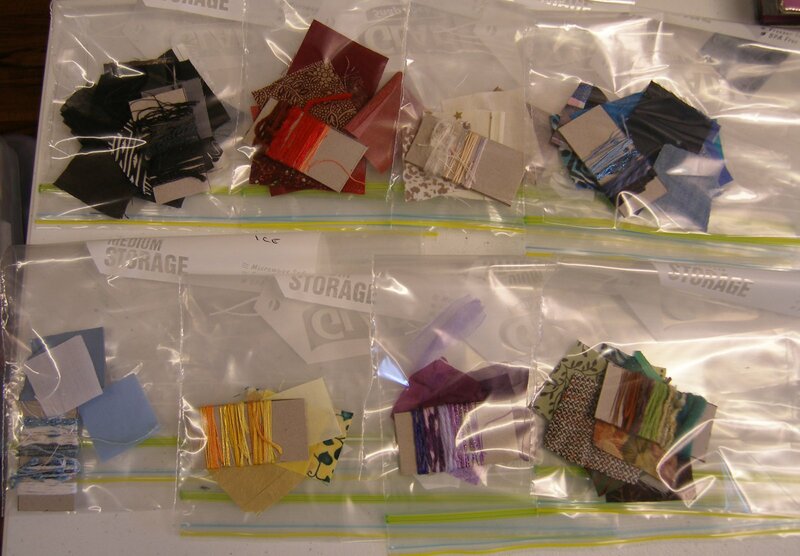 Firstly I created sample bags with fabrics and threads in different themes, the themes are ones I made up myself. 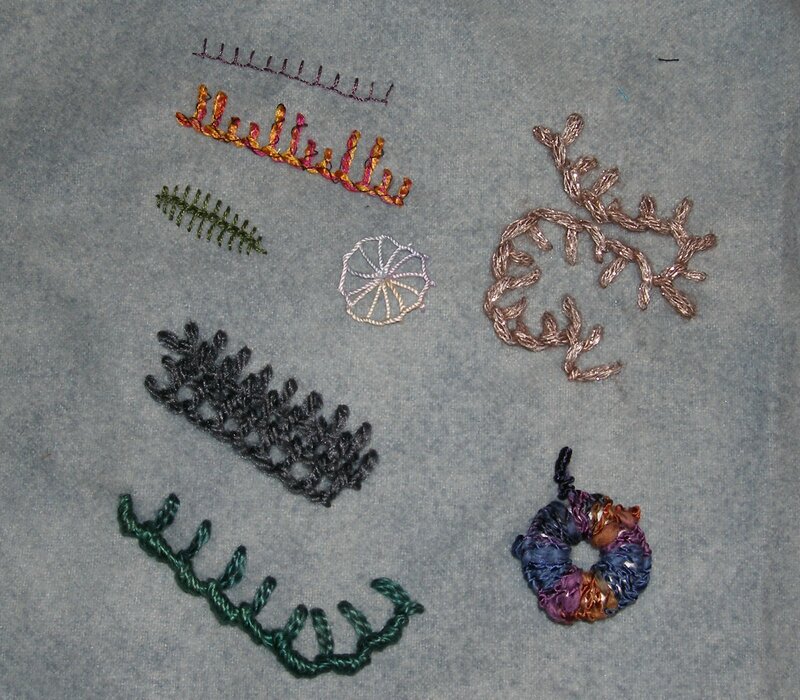 A number of stitches were suggested to try so I created samples of each of these, using different background fabrics and a selection of thick and thin threads for each stitch. Couching on black cotton. Couching is a great method for applying thick threads to a surface. Some of the ends of the thick thread in the sample below were taken to the back of the fabric to hide them but others were too thick so show on the surface. The thread used for couching was applied plainly, or in a brick stitch pattern, or at longer random angles. 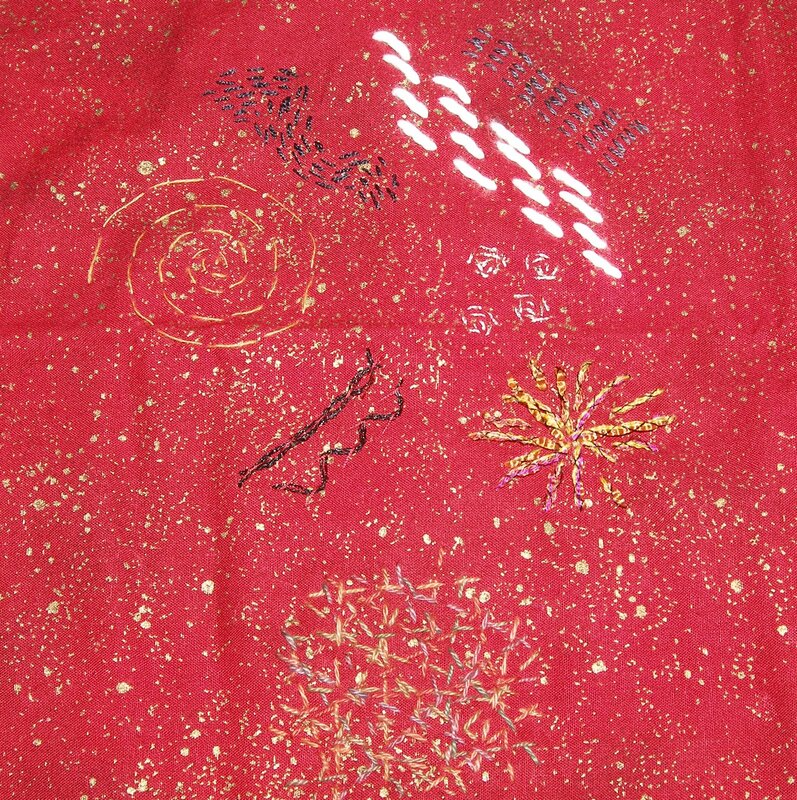 Couching is also used for a goldwork technique called Or Nue which can be used to create detailed shading of images. Herringbone on white muslin. Lots of interesting effects can be achieved with Herringbone by varying the length of the stitches, layering them or making rows to form a diamond pattern. I have also used it in this sample as a couching stitch to hold down a strip of mesh. Stem stitch on calico. 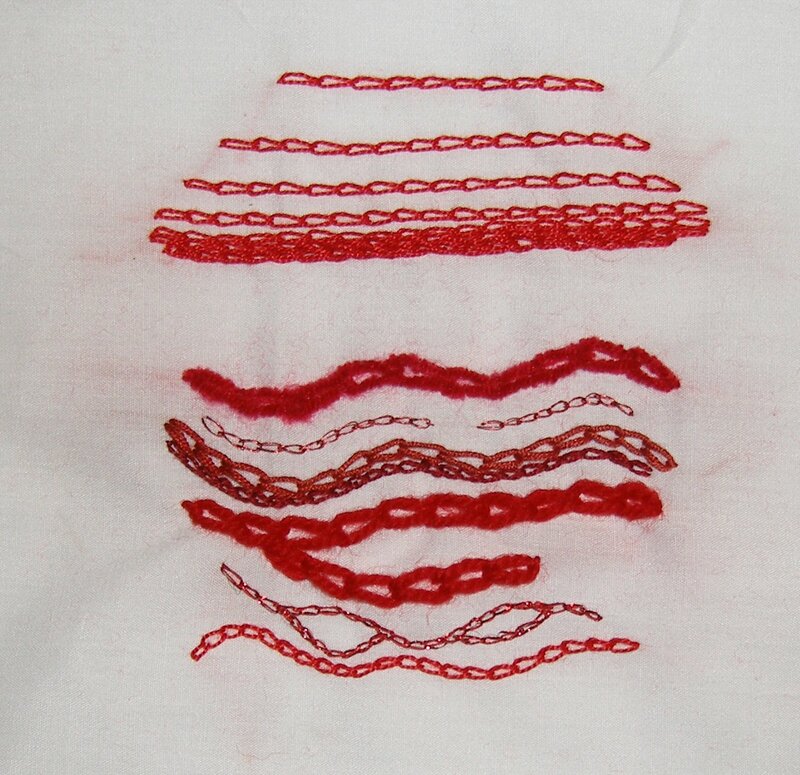 A time consuming stitch when fine threads are used but great for linear features and curves. This could be layered to form depth and also could be used as a base stitch which is then wrapped or buttonholed over for padding. 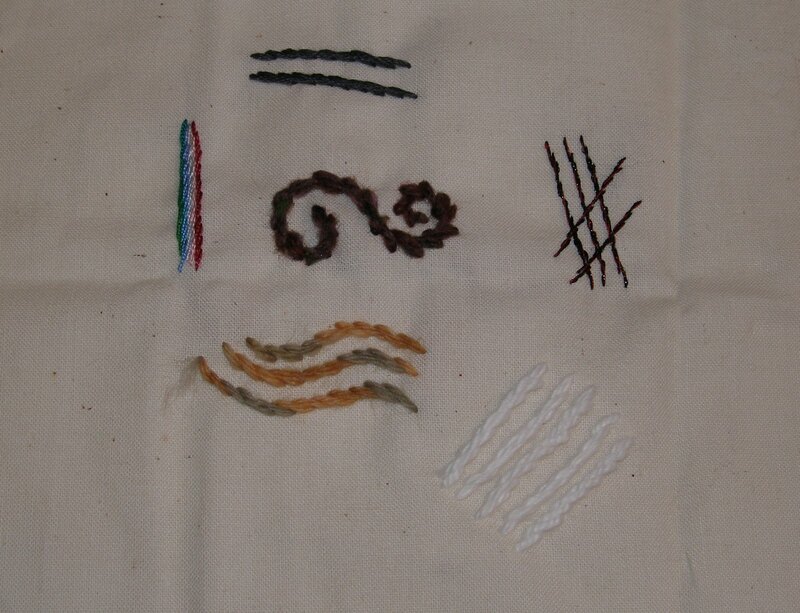 Cretan stitch (open and closed) on silk dupion. A lovely combination here was the use of silk threads on silk dupion fabric creating a lovely sheen whereas the example in pink wool jars both in terms of colour and texture. I have not used this stitch before so enjoyed experimenting with creating a flower and leaf pattern. I also like the barbed wire effect of overlapping the rows. Satin stitch on muslin. Good for filling in blocks of colour and different shapes. Using furry thread it makes a nice hairy red and green caterpillar in the sample! Cross stitch on evenweave. A very versatile stitch that lends itself to thick and thin threads, variations in size and being applied randomly or evenly. It also can be layered well. The sample bottom left has been overworked with buttonhole stitch which produces a very chunky stitch. Running stitch on cotton. Not the best choice of background fabric but the directions did say to choose a variety and this does show how important it is to have the right combination of fabric and threads. Running stitch is again very versatile as it can be long or short and applied straight or in directions. 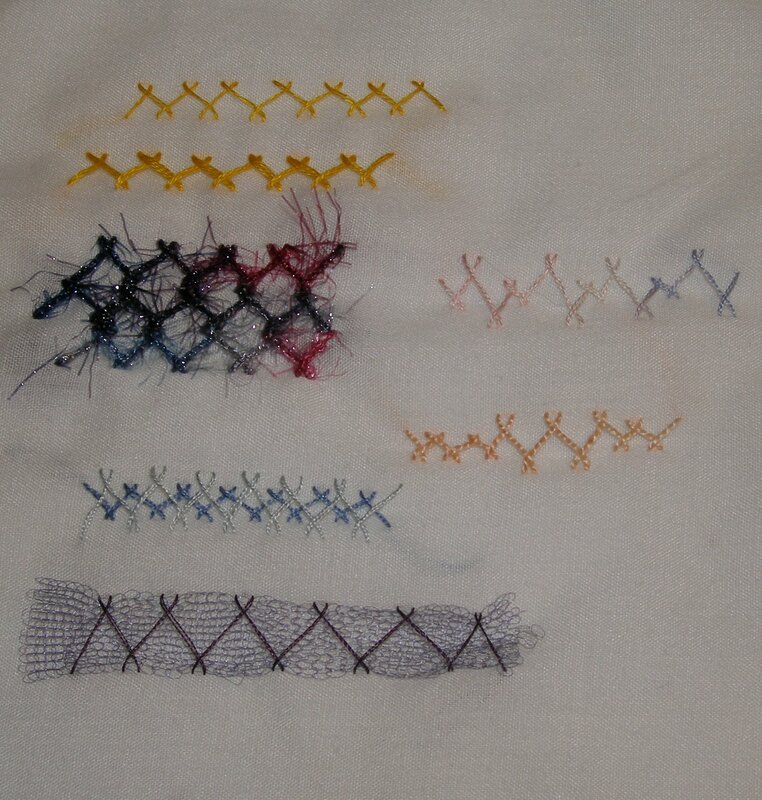 Additional effects can be created by weaving other threads through the running stitches or wrapping over them for height. Blanket stitch on short pile fleece. A practical stitch for edging fabrics but also very versatile for creating shapes and layering. I have also used buttonhole stitch here on a washer to produce a raised donut. 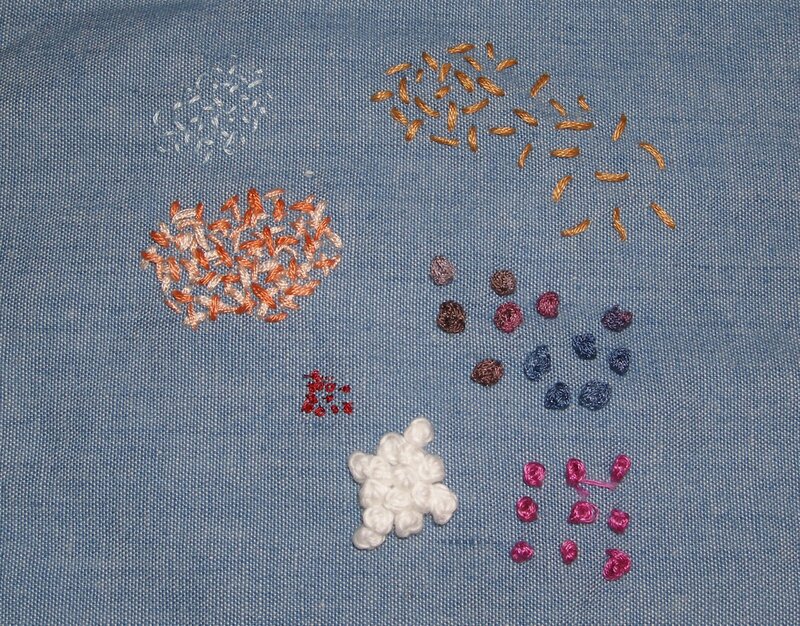 Seeding and French knots on lightweight denim. 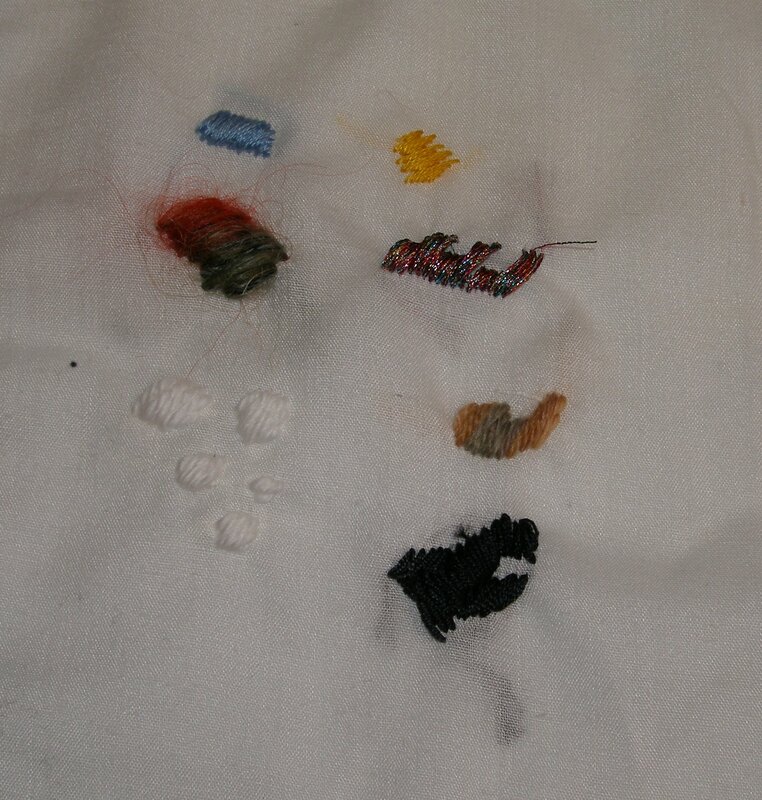 Seeding is useful to create shading and I liked using tones of the same colour and layering the stitch. 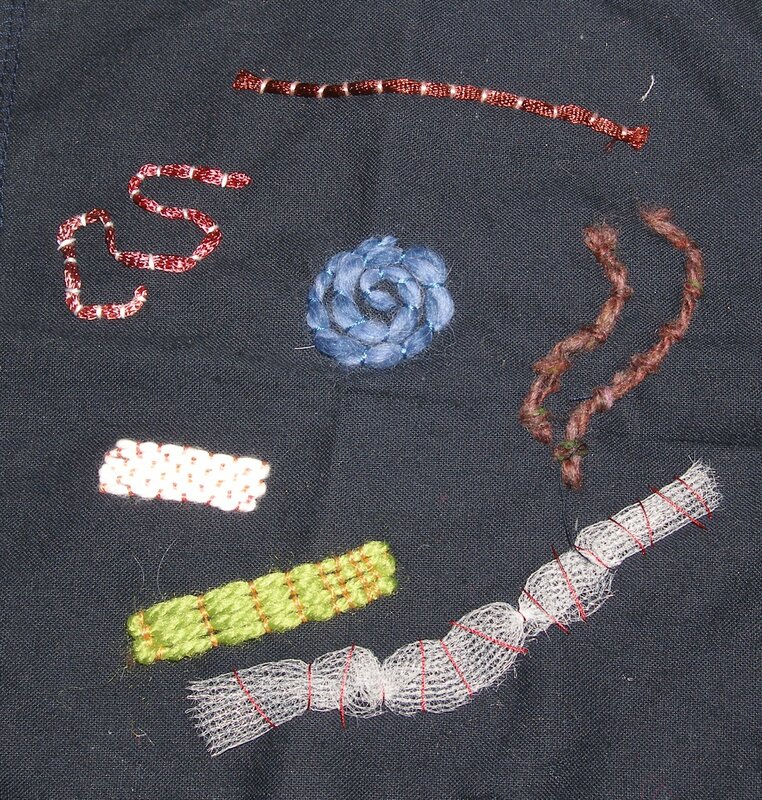 The French knots were difficult to produce in a fine thread but wonderfully textured in the thicker threads. 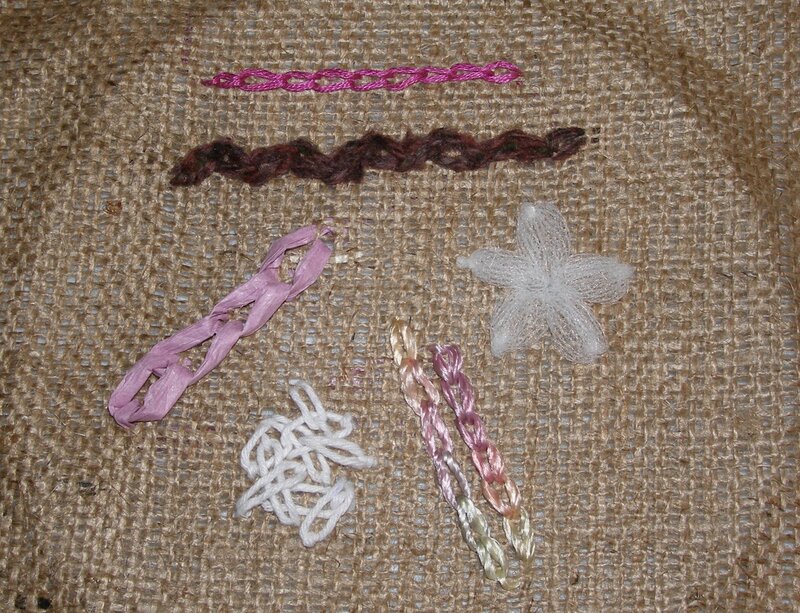 Chain stitch on hessian. Finer threads simply got lost in the open weave of the hessian so I selected thicker threads for this sample. The large open weave also means that other materials can be used so I used raffia, mesh strip and string as well as wool and silk threads. After these initial samples I used line stitches on plain backgrounds with toning threads in single colourways to focus on the effect of the stitching itself. 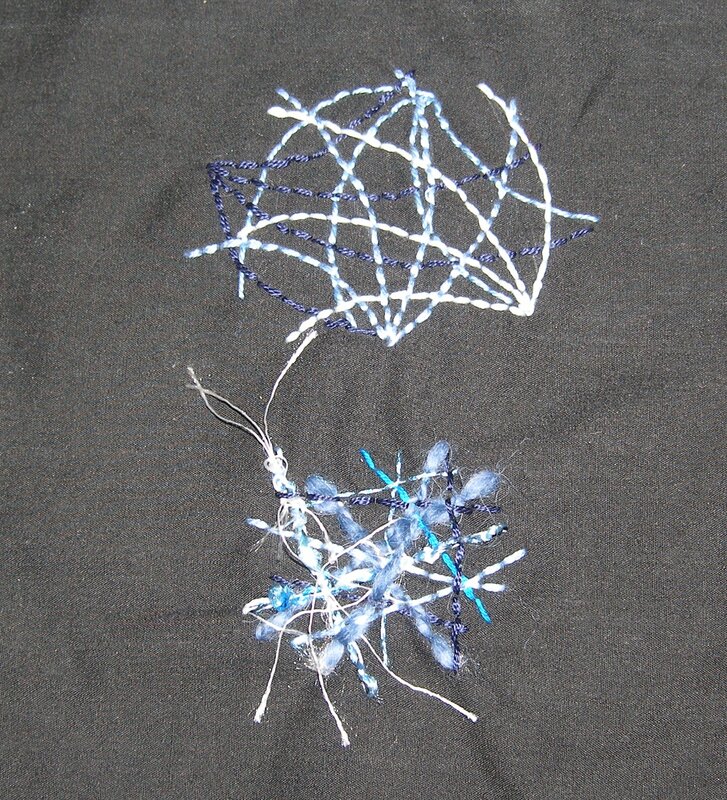 This sample applies chain stitch in straight lines that get closer until they overlap. 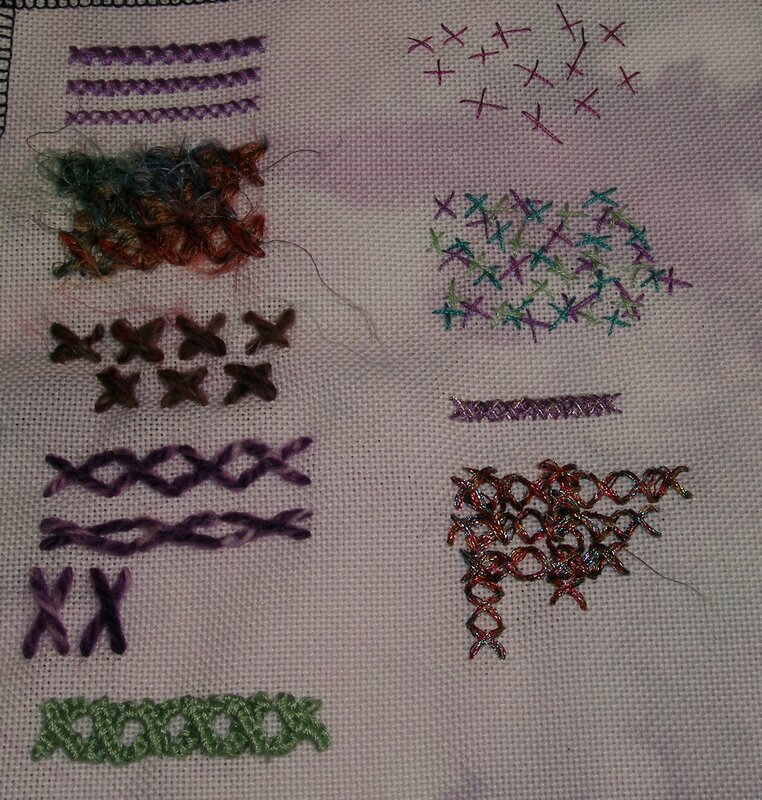 For the lower section I varied the threads, used wavy lines and some broken lines. This is very sea like in it’s effect and I like the combination of different threads and yarns but in the same colour family. Using the same colour on black poplin background muted the colours as can be seen below. 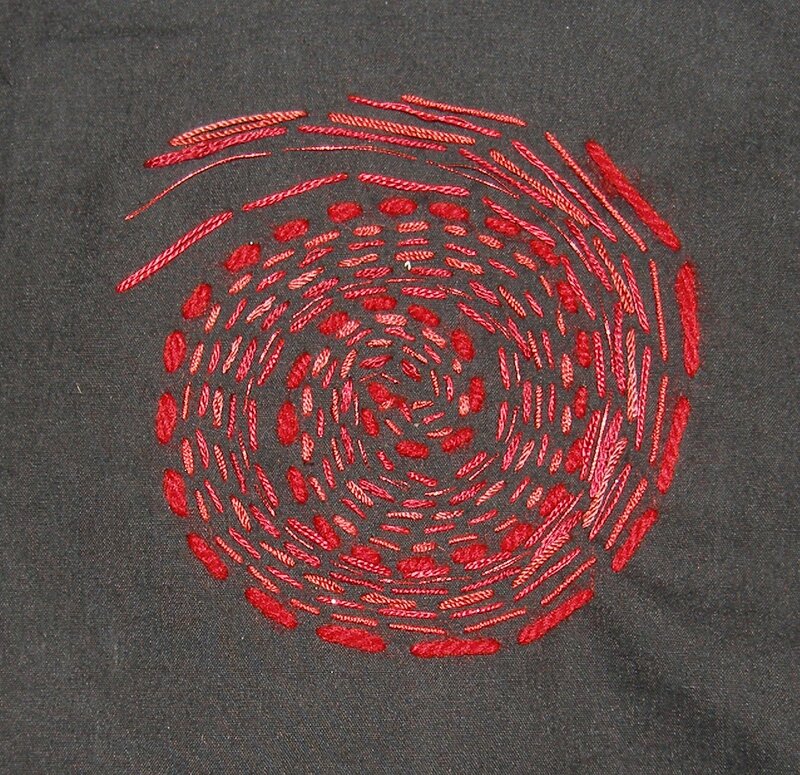 This simple spiral was created in running stitch, varying the length of the stitch as the spiral grew. The lower sample uses back stitch again but this time with a variety of fancy yarns and in random directions. These two samples could be aptly titled order and chaos and show how threads can be layered to produce very different effects. 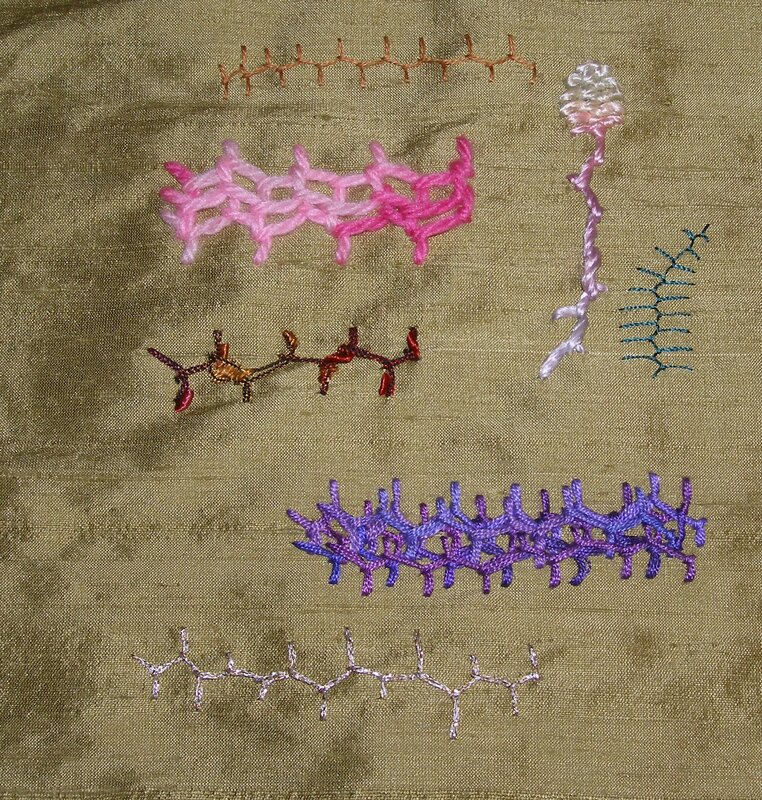 These samples were time consuming to work but provide the starting point for a library of the effects that can be created from different threads and stitches. I liked the layered effects the most as they add depth and a sense of freedom when compare to neat single rows of stitch.